The landscapes surrounding us are diverse—each area as distinctive as the next—composed of different soils, with a variety plants and animals dotting the land. In arid Southern New Mexico, mesquite-filled arroyos neighbor tree-lined pecan orchards—it is usually easy to see that landscapes across the region differ. To delve into an understanding of how and why this variation occurs across the landscapes in which we live, scientists at the Jornada Experimental Range in Las Cruces, NM, classify land areas into units called ecological sites. An ecological site is a distinctive area of land that produces different types and amounts of vegetation. Individual ecological sites differ in plant production, species composition, climate characteristics, geology, and soil properties, as well as the ability to respond to management actions and natural disturbances. Ecological sites comprise a land classification system that describes the ecological potential and ecosystem dynamics of land areas. When linked to mapping, these sites stratify the landscape and organize ecological information to allow monitoring and assessment; interpretation of resource hazards and opportunities; and prioritizing and selecting of land management actions to promote the sustainable use of ecological resources. 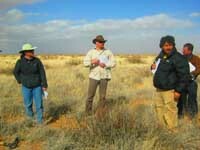 By breaking up land into basic units, scientists at The Jornada can translate the important and repeatable differences they find in vegetation, soils, and ecological processes into management recommendations. According to Jornada scientists Brandon Bestelmeyer and Joel Brown, “landscapes are not an incomprehensible jumble of plants, animals, and soils that respond in unpredictable ways to human influences. There are patterns and organization in their relationships.” The success or failure of land management strategies depends on the important and repeatable differences scientists can capture with the ecological sites. 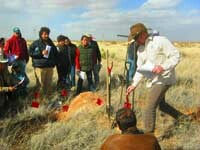 Ecological site classification is an active area of research at The Jornada. Scientists here emphasize the importance of classifying ecological areas for land management purposes, as well as for understanding the effects of climate change. To communicate the properties of ecological sites, scientists collaborate with land managers to create ecological site descriptions. These documents report climate, soil, geomorphology, hydrology, and vegetation information that describe the behavior of individual ecological sites. Since an ecological site might feature several plant communities that occur over time or in response to land management, these descriptions can be used to interpret ecological changes. Land inventory, analysis, and any resulting management decisions require a full understanding of these individual sites and their interrelationships to one another on the landscape. Ecological site descriptions relay that goals and expectations for a particular area will vary across the landscape. By documenting ecological sites, scientists can more precisely specify what these different expectations will be—a great benefit for private landowners, public lands users, and government regulators. In this way, ecological sites can help avoid environmental degradation and conflict. Ecological site descriptions are housed by the National Resource Conservation Service (NRCS) and developed with its partners. The U. S. Bureau of Land Management (BLM), The Nature Conservancy, and several other organizations use these important documents to aid management and ecological research. A recent memorandum of understanding between the NRCS, BLM, and U.S. Forest Service established ecological site description development as an interagency priority. 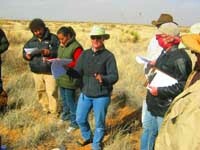 A comprehensive manual for developing site descriptions in the United States was produced by the NRCS, which created national standards and protocols for collecting site data (Interagency Ecological Site Handbook for Rangelands). A key to understanding landscape variation is the state-and-transition model. State-and-transition models describe the patterns, causes, and indicators of transitions between ecological communities within a site. This model distinguishes why one landscape looks so different from another nearby, even within the same ecological site. By synthesizing the data, literature, and knowledge tied to particular ecological sites, researchers can identify changes in vegetation and soils that are easily reversible versus more difficult or impossible changes that fall beyond the threshold for reversal. The model describes all possible states, phases, and transitions between ecological communities, providing important information about mechanisms, triggers, and signs of threshold development. Pedoderm: a description of the material at the air-soil interface area found in the top 3 centimeters of the soil’s surface. Resource retention: a classification of the spatial pattern of vegetation, which indicates resource movement and erosion rates. 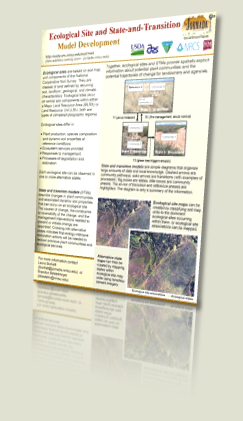 Soil redistribution: an examination of the surface features of an area to classify the spatial extent and amount of eroded or deposited material. Combined, these three classes link surface soil processes to the state-and-transition model’s explanation of ecosystem change. This missing link supplements ecological site data with information that was previously not well represented in inventory datasets, creating a more robust picture of an area’s ecosystem dynamics. The PPCs also provide a readily accessible language for discussing the role of soil surface processes in ecosystems, which can be applied by soil scientists and other natural resource professionals conducting extensive field surveys. The development of the PPCs is becoming an important part of documenting ecological sites in the arid lands of both the U.S. and other countries, including Mongolia. Ecological sites comprise a land classification system that describes ecological potential and ecosystem dynamics of land areas. They are used to stratify the landscape and organize ecological information for purposes of monitoring, assessment, and management. This page provides some definitions for ecological site descriptions (ESDs) and provides tools and literature pertaining to their development. Explore the ESD links further for more information or see this link for a printable summary sheet.